STOKENHAM is a parish and village in Kingsbridge union, containing, by the census of 1861, 1566 inhabitants, and 6011 acres; in the deanery of Woodleigh, archdeaconry of Totnes, diocese of Exeter, hundred of Coleridge, East Devonshire; 6 miles east from Kingsbridge, on the coast of the English Channel. The vicarage, with that of Chivelstone and the curacy of Sherford annexed, is valued at £695 per annum, with residence, and is in the incumbency of the Rev. John Charles Carwithen, M.A., and the patronage of the Crown. The church is a large ancient edifice, dedicated to St. Michael, with tower containing six bells. There is an excellent National School for children of both sexes, with residence for the master attached. STOKELEY is the occational residence of Sir Lydston Newman, Bart., who is lord of the manor. WIDDICOMBE is the residence of Arthur B. E. Holdsworth, Esq., who is lord of the manor called the Priory, and impropriator of the rectorial tithes. 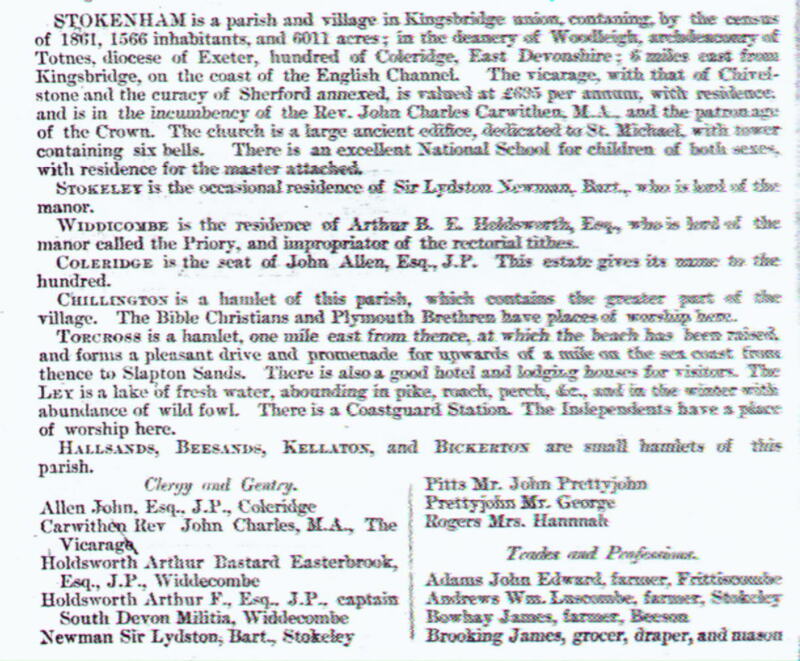 COLERIDGE is the seat of John Allen, Esq.,J.P. This estate gives its name to the hundred. CHILLINGTON is a hamlet of this parish, which contains the greater part of the village. The Bible Christians and Plymouth Brethren have places of worship here. TORCROSS ia a hamlet, one mile east from thence, at which the beach has been raised, and forms a pleasant drive and promenade for upwards of a mile on the sea coast from thence to Slapton Sands. There is a good hotel and lodging houses for visitors. The LEY is a lake of fresh water, abounding in pike, roach, perch, &c., and in the winter with abundance of water fowl. There is a Coastguard Station. The Independents have a place of worship here. HALLSANDS, BEESANDS, KELLATON, and BICKERTON are small hamlets of this parish. 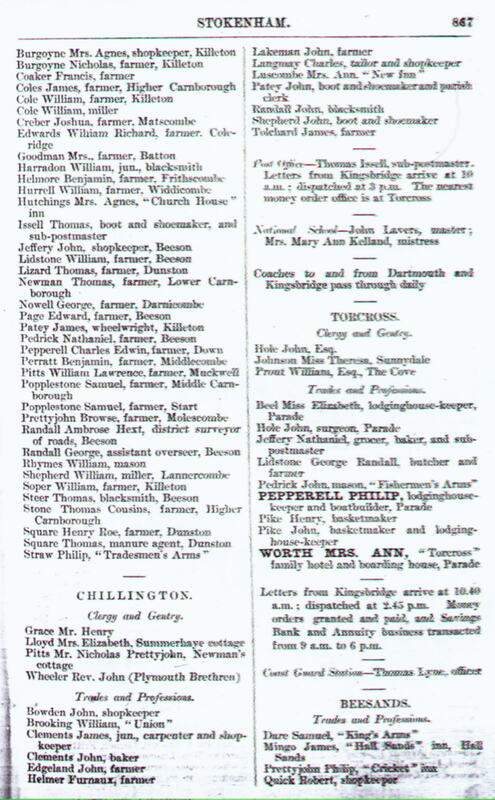 Luscombe Mrs. Ann, "New Inn"
Pedrick John, mason, "Fisherman's Arms"
Letters from Kingsbridge arrive at 10.40 a.m.; dispatched at 2.45 p.m. Money orders granted and paid, and Savings Bank and Annuity business transacted from 9 a.m. to 6 p.m.